Sandwich is a small town in the English county of Kent. In 1729, ten year old John Montagu became the 4th Earl of Sandwich, inheriting the title from his grandfather. As the story goes, the Earl grew up to be a keen gambler and enjoyed playing cards. Rather than waste good card-playing time eating dinner, he would request food to be brought to the card table and ate whilst playing. He realised that placing the meat between pieces of bread allowed him to eat the food easily without getting his fingers greasy, and this meal quickly became a firm favourite. Fellow card players thought this was a great idea and were soon to be found asking that their food be served in the same way as Sandwich’s and the term sandwich quickly entered the language. You can make sandwiches out of pretty much anything, and there are several examples within Glitch. For our first sandwich, we’ll start with a nice easy one, the Cheezy Sammich. This really couldn’t be simpler. Cut the bun in half, horizontally. 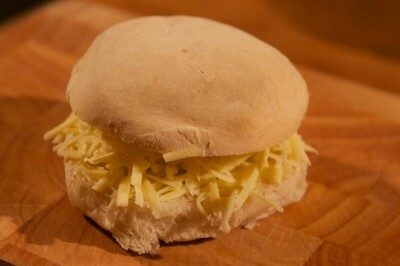 Grate the cheese and sprinkle on the bottom half of the bun. Place the other half of the bun on top. Eat. You can, of course, use pretty much any kind of cheese here, but I think it’s hard to beat a good mature cheddar when it comes to a cheese sandwich. Here, I’ve followed the Glitch recipe pretty faithfully and not added any extra ingredients. To make things even better, though, spread a little butter on each half of the bun, and some thinly sliced onion or a generous dollop of Branston pickle is always a welcome addition. 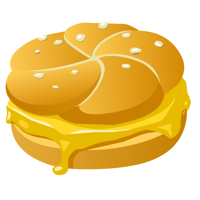 This entry was posted in Meals and tagged bun, cheese, cheezy-sammich by dopiaza. Bookmark the permalink.